Unlocking the Yoga Poses, or what stops you doing a pose perfectly? This note provides a deeper look into how the Stretch Therapy system can help the keen yogi to improve her postures. 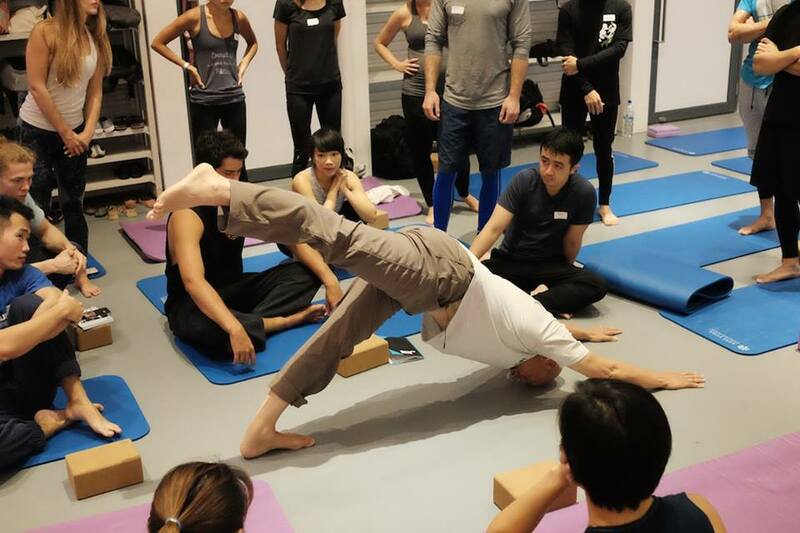 In this article I will consider what real, physical limits might stop someone from doing a technically perfect Adho Mukha Svanasana, or down-facing dog pose. Many beginning yogis struggle to do this pose well; most generally and in most schools, the pose is said to be done well when both heels are held on the floor, the inside edges of feet parallel and the knees held straight, the whole spine gently extended from the hip joints and that line continued by the arms and, in the final stage, the face, or top of the head rests on the floor. Being able to position the body in this way requires multiple capacities: ankle and calf muscle flexibility, the sciatic nerve needs to glide along its full length (more on this later), sufficient hamstring length to allow a significant degree of anterior pelvic tilt while all posterior line muscles and fascia of the hips and lower legs are under strong stretch, and enough strength in the arms, shoulders, and trunk to hold the desired shape against these forces. The beginner’s body has many ways to avoid these requirements: the heels may lift off the floor, the knees may bend, the hamstrings may limit anterior pelvic tilt (with the result that the lower back flexes, instead of extending slightly) and the shoulders may not flex enough to allow the desired line (the shoulder angle will be ‘closed’ rather than open, the position of the arms continuing the visual line of the spine). And there simply may not be enough strength in the trunk to hold the middle and upper back straight against the calf and hamstring forces that are trying to flex the spine, let alone the gentle whole-spine extension that aesthetics require. Let’s look at each of these restrictions in turn. It is sometimes said that structural limitations in the ankle in some people will not permit a perfect execution of this pose, but this is not my experience. Many people cannot squat in the West either and will often blame structural limitations, but everyone in the pre-industrial world can squat. There are many reasons for this, but the main one is that we do not squat to rest as is normal in the non-Western world and we spend significant time in daily life sitting on something. And it is true that many students do feel compression in the front of the ankle joint when squatting (or trying to perfect down-facing dog); this is because until soleus (in the squat) and both gastrocnemius and soleus (in down-facing dog) are sufficiently flexible, the forces required to lengthen them are resolved as compression forces in the front of the ankle: this is because we are levering off this joint (talus and the tibia) to generate the stretching force. When the muscles, fascia, and tendons have sufficient length, the compression sensation will disappear. Until that time, this compression will be experienced as a “blockage” or a physical restriction. An aside: many people feel a cramping in the shins when trying to squat: this is because anterior tibialis is contracting as hard as it can to pull the knees forward far enough so that you don’t fall backwards; a lack of ankle flexibility is the first reason people can’t squat lower than a certain point with their parallel feet flat on the floor—they simply cannot move their whole-body balance point (centre of gravity) far enough forwards to counteract this tendency. Either they stop lowering their hips, or fold the trunk forwards strongly at the hips to move the centre of gravity forwards. And, a further aside: any muscle that is asked to work hard in the contracted end of its range of movement is liable to cramp; try pointing your foot hard as you read this and you will feel what I mean. To relieve the cramp, you lift the toes towards the knees. And in the case of anterior tibialis cramping while squatting, the opposite movement will be needed: you need to point the toes. Perfect execution of the full version of down-facing dog pose requires mastery of what we call the “Single Leg Dog Pose” (“SLDP”) as the first step, we believe: because only one leg is worked at a time, and the non-working or lifting leg is used to position the pelvis (more on this below), the weight and strength of the whole trunk and non-working leg can be used against the tension of the stretching leg; this version is significantly easier than the full version and, because you will be able to feel and reposition the pelvis as well as extend the middle and upper back, the essential whole body awareness that the full pose requires will be able to be developed over time. Kit demoing SLDP on a recent workshop in Singapore. A description of the SLDP follows; suitable for beginners and intermediate students, instructions on what to be doing at each step in the pose are included. Ideally, one will be working in a room that has a mirror off to the side so you can see what shape your body is making and your hands and feet will be on a sticky mat. The first task is to stand, bend at the waist and the knees, and place the hands on the floor, straighten the knees, and walk the hands away from the feet. Keep walking out until the heels start to come off the floor: you have now reached the limit of your active ankle flexibility. In the process you have already established the fundamental geometry of the pose, which is how far away from the heels should the hands be. Now bend one leg at the knee and let us call this the ‘non-working’ or ‘lifting’ leg and rest on the ball of its foot. Most of your weight is now on the stretching leg, and you will feel its heel pressing harder on the floor as a result. Take in a breath and, as you exhale, raise the lifting leg out behind you so that its knee is straight and the ball of the foot is about 300 mm from the floor. Put all your attention into the hip of this leg and drop it down towards the floor as much as you can; in this process you will become aware of the outer hamstring of the stretching leg. One of the ways that the body avoids the stresses of the single leg dog pose is to lift the hip of the non-stretching leg so that the pelvis rotates away from the outer hamstring on the stretching leg. Now move your awareness to the stretching leg and use the strength and weight of your body to press its heel down onto the floor firmly again and make sure that its arch is lifted away from the floor. If your ankles have a tendency to pronate you can try externally rotating the stretching leg (in both the ankle and the hip joints; the pelvis remains still) using external rotators. As you do this you will see and feel the arch lifting away from the floor. Now move your head and neck so that you can look up between your hands resting on the floor. We strongly recommend pressing the arms firmly away from the body as far as possible: this shoulder girdle positioning is how gymnasts do handstands and they are among the strongest athletes on the planet. As well, we have seen many people who rest their body’s weight on the shoulders and let the shoulder girdle rest on the rib cage can develop shoulder injuries in time. If you press the arms out, actively away from the body (scapula elevation), you will be holding any position on your trapezius muscles and tensed shoulder and triceps muscles instead of on the shoulder joints themselves and the pose will be active rather than passive in this part of the body. By looking up between your hands on the floor you will also slightly tighten the upper trapezius muscles and this will help the essential thoracic extension to occur (more below). As well, you can try lifting the sternum in the direction of your chin; this too will have the effect of starting the extension of the thoracic spine. But suppose that you are slightly kyphotic, or have difficulty in straightening your thoracic spine in normal daily life, as many who work at computers do? When you give yourself the cue “lift my chest” do you think you’ll be able to do so in this strongly loaded position? Of course, the answer will be ‘no’. And if this restriction is present in your body, you will benefit from doing a passive back bend before you practise the SLDP next time. Doing a passive back bend (draping the body backwards over a firm, curved surface) will open the chest and the rib cage, the intercostals, and stretch the abdominal muscles, too. This experience will show you how to lift your chest and flatten the thoracic spine, in all poses, eventually. The key point here is that unless you have had the experience of moving or holding your body in a particular way you will not be able to move it this way when you want to, especially when all the involved structures are loaded. By draping ourselves over a curved surface we can more easily experience the movements in the body that will translate into movement in the pose when we give ourselves the self cue “lift my chest”. Until this movement is experienced with awareness, with full attention on what it feels like—to put this more starkly—unless you can do this in other words, it will not be a movement you can call on at will. It will remain a concept. Now move your awareness into the lifting leg. Extend that leg behind you as though you were trying to reach the wall behind you and immediately you will feel the glute (gluteus maximus) on that side tighten. Use the gluteus maximus muscle to slowly lift the straight leg away from the floor and, in the process, you will feel the lumbar spine extending as the pelvis is anteriorly rotated. Here we are using gluteus maximus to lift the leg but it is the hip flexors on the other side of the spine that pull the spine into extension during this movement. And as you lift the non-working leg up you will feel any elevation increases the stretching sensation in both the calf muscle and the hamstrings on the stretching leg; this is partly because in the process of anteriorly tilting the pelvis while in ankle dorsiflexion the sciatic nose is stretched maximally. The other reason is that this movement of the pelvis moves the ischial tuberosities, where the hamstrings originate, further away from the knee. One needs to elevate the non-working leg slowly for this reason; the sensations of increased stretch get stronger rapidly. Where do you feel the main effects of this leg movement? If you feel it mainly in the outermost calf muscle of the stretching leg (gastrocnemius) you have just uncovered your first restriction in this pose. Various options are open to you at this point: you could exit the pose and use a wall calf stretch to lengthen gastrocnemius. Or, while staying in the pose, you can try gently pressing the ball of the foot into the floor without lifting the heel, an isometric contraction (muscle activation without limb movement). This will increase the sensation in gastrocnemius strongly. We recommend doing contractions for 5 to 10 seconds; the exact duration is not important we have found, but putting your full awareness into the sensations in gastrocnemius on the stretching leg is a critical aspect of the technique. Following the contraction, release all effort in the leg and foot, and take a full breath in. On a breath out, press the heel of the stretching leg firmly onto the floor and, if possible, try to walk your hands a little further away from your feet. If you are successful, you have just decreased the angle between the stretching leg and the floor and just opened up gastrocnemius and soleus as a result. This is step one. Remind yourself to do a strong calf stretch before you attempt the SLDP the next time you practise. Now move your awareness to looking up between your hands. Make sure that the knee of the stretching leg is pressed gently straight and the heel is firmly on the floor. Take another deep breath in and, as you breathe out, press the hands further away from the body and while still breathing out use your hip flexors to pull your chest towards the floor slowly. At the same time the non-working leg is reaching out behind you and lifting up away from the floor until the leg is in the same line as the line of the spine. Make sure that the hip of the non-working leg does not lift (rotate) away from the floor; in countless beginner’s classes this is the correction that is most often necessary to make. If you do have the benefit of working with a partner I will describe partner assistance below. In the process of trying to get into the position I have just described, where do you now feel the major effects of this pose? If the main sensation is in the hip joint of the stretching leg or strongly in the outer hamstring (and perhaps the outer calf muscle) then it is possible that piriformis (one of the external rotators of the hip) is limiting the movement of the sciatic nerve itself. Modern chiropractic research suggests that piriformis syndrome is the major cause of sciatica in about 60% of the general population. We may assume that at least a percentage of your students will feel the restriction in the same place. An option here is to exit the single leg dog pose once again and to do one of the stronger piriformis exercises and then re-enter the pose. If you find that the sensation in the hip and the outer hamstring has changed you have learned something more about how your body is organised and the next time you attempt the single leg dog pose make sure you do a piriformis stretch first. We have the best ones on our YouTube channel; search on ‘piriformis’. One of the great virtues of the single leg dog pose are its strengthening aspects and the other is the extent to which the positioning of one’s various body parts become clear in one’s awareness. We have found that working the single leg dog pose yields much faster results with respect to one’s capacity to do the full version of the pose than working the full version of the pose for the same amount of time. We believe this is because the ‘partial’ version of the pose allows identification and rectification of restrictions more easily. Let me describe partner assistance for a moment. One of the features of our work is that we have a huge range of partner assistance techniques. A sensitive partner allows you to make much faster progress towards the final solo version of the pose than working alone. This is because the partner can help you make the corrections that you may not be strong enough or flexible enough to make yourself at that point and this changes the involved structures more efficiently. For example, a partner can stand in between your hands and gently press the sacrum down in line with the stretching leg with a straight arm, as I am demonstrating in the image (below). As the partner’s weight is felt, you can relax part of the heel-pressing effort and you can then use this energy for making a other corrections. The stretch in the lower leg will be greater, but is more easily tolerated; part of this effect is having the tactile experience of being assisted by another human being—it is not only a matter of some extra weight in the right direction! As well, if a partner is helping hold your heel onto the ground you will be able to walk your hands a little further away and hence the stretch in gastrocnemius and soleus will be increased. If the partner then looks at your thoracic spine and gently places a flat hand on the roundest part of it, you will have another tactile cue: your work is simply to try to lift the sternum so that the roundest part of your thoracic spine flattens; this immediately improves the pose. Assisting a student to get a deeper stretch; my weight is mainly in my R arm–hand; this keeps the heel on the floor. Taken at a recent workshop in Berlin. A partner can help in other ways too. If you find the major restriction in the single dog pose is felt in the calf muscle, ask your partner to feel the skin on this part of the body and ask them to try to move the skin sideways or up and down a small amount. If fascial adhesions are present your partner will not be able to move the skin even an millimetre or two; it will feel as though the skin is stuck solidly to the muscles underneath. This fascial adhesion, if present, will physically limit your capacity to further dorsiflex the ankle. Robert Schleip explained to me that if the superficial fascia adheres to any muscle and that muscle needs to lengthen more to complete the pose, the brain senses the facial adhesion as a genuine physical restriction and will not let the movement occur. It is experienced the same as trying to do a pose while wearing tight non-stretching jeans: deeper movement simply stops. If a partner can mobilise this fascia (which is a simple matter of literally moving the skin across the muscle or up and down along the muscle or both) the person being worked on will immediately feel that they can go deeper into the stretch. This is not a psychological effect: it is a genuine restriction in the superficial fascial body. In our system we have developed a collection of techniques called RollStretch: someone trained in our system could use a stick or the heel of a palm to gently mobilise the skin and the fascia while the person is in a strong calf muscle stretch, for example; the result is an immediate increasing range of movement. Similarly, someone who is trying to do the full forward bend over straight legs (paschimottanasana) can feel that there are restrictions in their hamstrings in this position, and yet in other poses their hamstrings can be quite loose. If a partner checks the skin and fascia over the lumbar and thoracic spines, often one can uncover the same stuck fascia phenomenon, and following a simple movement of the skin over the top of the muscles (both in cross friction fashion and in longitudinal movement) one’s capacity in this pose can be improved hugely. Your partner does not need to be some kind of body work expert to effect this change. I discovered this on a workshop when my partner Olivia (who has very flexible hamstrings) was trying to do paschimottanasana (called the “pike” in diving and gymnastics). She had her body just below 45° with respect to the floor. When I became aware of the restrictions in the fascia over her thoracic spine I loosened them (this took about 30”). As soon as I did, she was able to put her face on her shins immediately with a back that was straighter than before. She can now do a perfect paschimottanasana without any preparation. The important point here is that until this fascial release was done she felt that the restrictions were in her hamstrings and calf muscles, and the further important point is that the effect of the release was immediate. Let me return to the idea of one’s structure limiting one’s potential movement. In the Stretch Therapy system we personally have worked with well over 20,000 students over the last 30 years. Many of those students came to class with the idea that their bony structure was a limitation to movements they wanted to acquire but in very few cases was this idea accurate. The vast majority of people are limited in their attempts to master any yoga pose by simple inflexibility or lack of strength and/or awareness. “Inflexibility” is nothing more or less than the movement patterns of the lifestyle the person has engaged in up to this point. There is usually a ‘directionality’ to these changes. We call this an individual’s developmental trajectory. The body is adapting to the demands that one places on it all the time and, for the majority of the population, most of these adaptations are the changes that we call ageing or dysfunction. By adding a weekly stretching or yoga class or two you are changing your developmental trajectory. What we described as an inability in any movement pattern is simply the result of a lifestyle where that movement pattern is not present. As I mentioned above, many Western people cannot squat easily, and their experience is that they can’t do it. As soon as one incorporates a few practices that lead to the doing of the squat the perspective in the mind changes to “I can squat”. It is too simple to say that the restrictions all “in the mind” because we do not have a conscious access to the many processes that control function. If one engages in practices that change one’s movement patterns and one’s physical range of movement however, then the somatosensory cortex has been remapped and then one’s experience in the body is that which was not possible now is. The perception and the experience of this changed capacity is the change. Very little in the muscles, tendons, ligaments and other fascial structures changes a great deal, we believe. In our system we are using bones ligaments tendons and skin explicitly to re-map this part of the brain which is not consciously accessible. From the outside of course it just looks as though someone is stretching or doing yoga and over time they become more flexible and stronger. Progressing from the SLDP to the full, both legs, version of the pose is a simple matter, once the SLDP is mastered. By “mastery”, I mean that one is able to do the complete version of the SLDP on both legs—I mention this because it is common to have asymmetrical flexibility! Once you can do the SLDP on both sides without a great deal of effort, and without a partner’s help, then it is time to try the full pose. All cues (apart from raising the leg behind you) are attended to. Key is keeping both heels on the ground, pressing the arms away from the body, lifting the chest and, on an exhalation, gently pulling the chest towards the floor. Here is the SLDP on YouTube: use of the ladder bars enables the unloading of the arms and shoulders to a degree, which can allow you to hold the position for a long period – many people have found that their calves respond well to a long-held stretch. Two programs on our Vimeo channel contain numerous exercises for calves, hamstrings and piriformis. Check them out below!